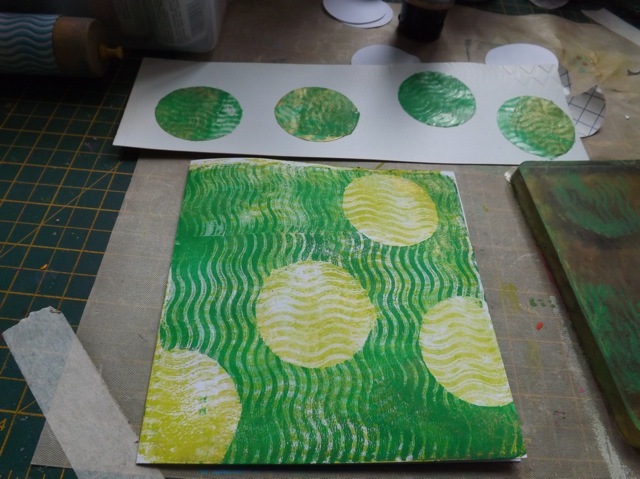 Homemade Gelli plate tools – from PAPER! 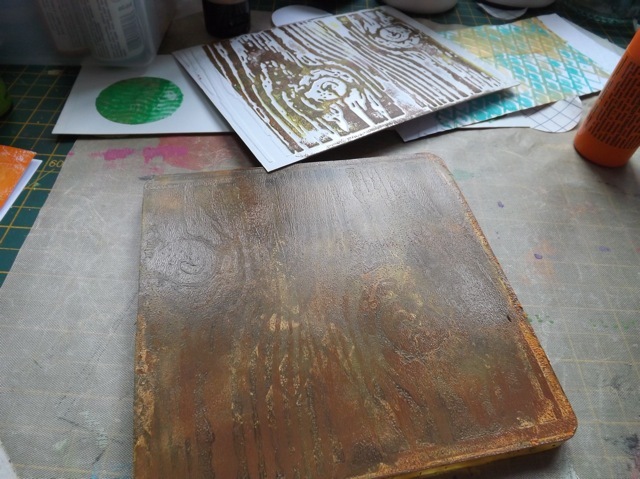 I have been having a right old play and came up with a handful of what I think are surprising tools for Gelli Plate printing. For today I am going to focus on PAPER tools – because, frankly, if I tried to do them ALL this post would be book-length LOL! 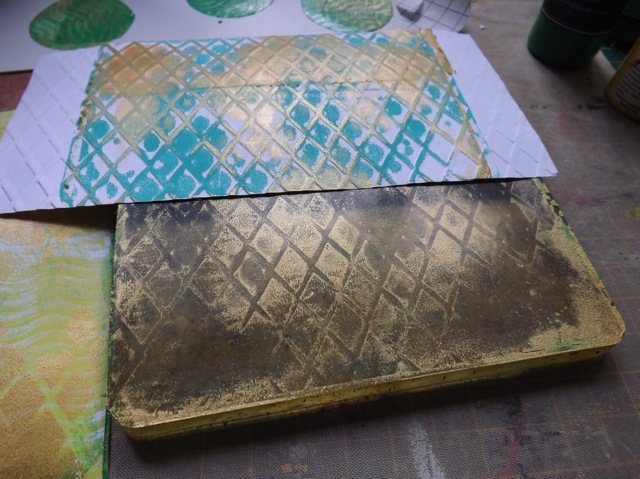 OK, so remember a week or so back I said I had the idea to use my embossing folders as texture plates, and that I saw someone had done that? 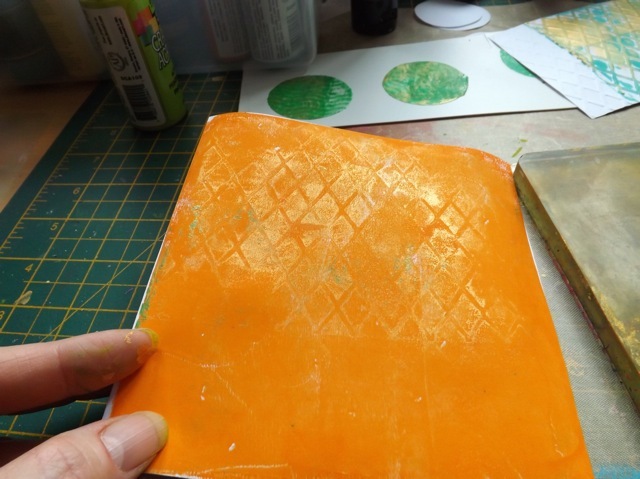 I was thinking on that and recalled the MANY times I had tried to use my embossing folders for their intended purpose (i.e. embossing cardstock) and because I hadn’t been as attentive to the cleaning process as I should have been, I mucked up my pristine cardstock. DOH! So I was thinking I should do what I’ve done before and emboss a bit of thick packaging acrylic and use that instead. Fine and dandy, but I had used up all my packaging. So I got to thinking – would just good old cardstock (or maybe thinnish cardboard) work? By gosh and by golly, it does! 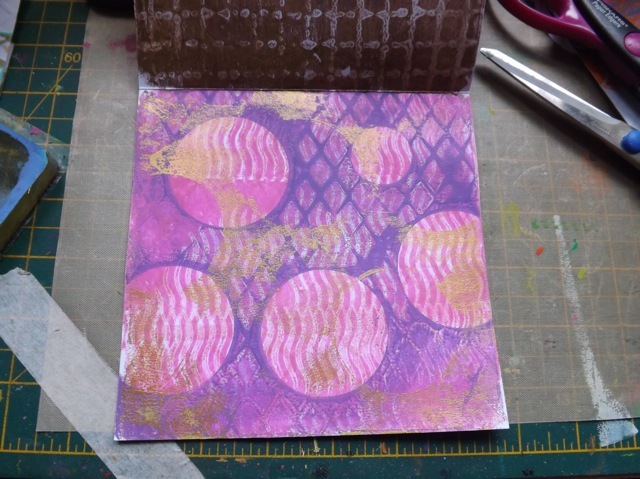 I embossed some cereal-box weight card – I cut it to the size of my Gelli plate then embossed the whole area, not just the once thru. 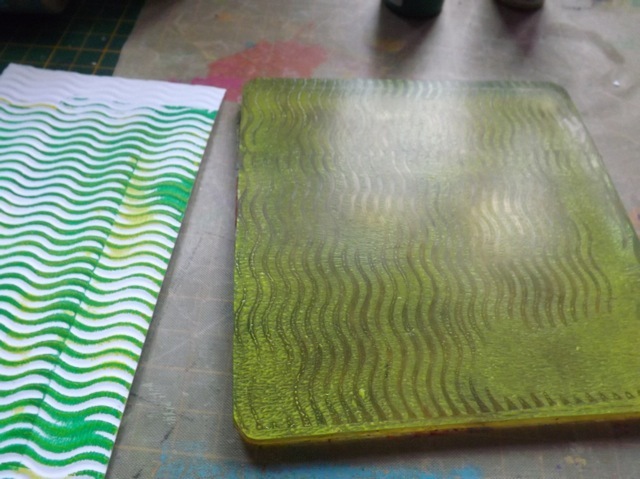 No, it doesn’t line up exactly, but Gelli prints aren’t meant to be precise so I don’t care. You can see the cardboard “plate” there at the top and kind of see the plate, pre-print. I had pulled a clean-up print , which you will see later, and added the wood-grain over it. I have to say I think it looks pretty cool. This is another one. again, a clean up print. So that got me thinking. If this worked, what other stuff did I have that would ALSO work? I thought about THESE that I found while tidying up. This time, I simply embossed heavy cardstock – the rubber embossing mechanism is simply not strong enough to emboss anything heavier and give a good, deep, impression. 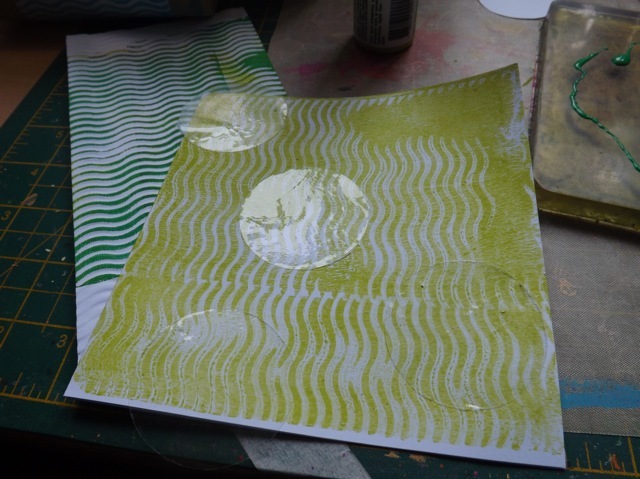 The trick is to work quickly – lay the paper on the rolled-out paint and sort of pat the back – you only want to remove the paint that is in contact with the raised embossing. Press too hard and you will remove too much. You can see the print. 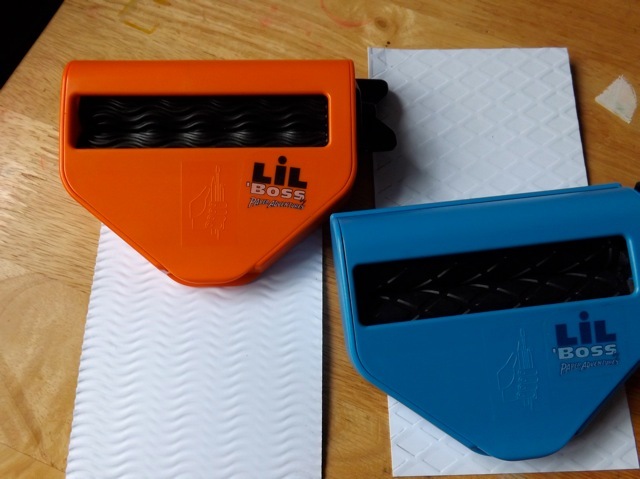 The width is limited to the width of the roller. Another thing I tried – I was getting a little frustrated with masking. The paper circles kept slipping. So I grabbed a roll of contact paper – it has just enough grip to stick to the print. Just make 100% sure the paint is DRY or it will stick too hard and rip! I printed another layer, with the waves in the other direction. I like this one! You can see I have pulled of the contact paper circles and stuck them to a bit of an old plastic placement. That lets me use them again. Next I tried wrapping the embossed strip around a kid’s block. That worked too, but the waves are fairly light as there is native pressure from the weight of the block itself. This was pulled off the dirty plate from the previous print – remember I mentioned you can get clean-up prints with other than white, heavy-bodied paint? This was pretty thin-bodied craft paint and it really pulled up the ghost of the last one, as you can see. 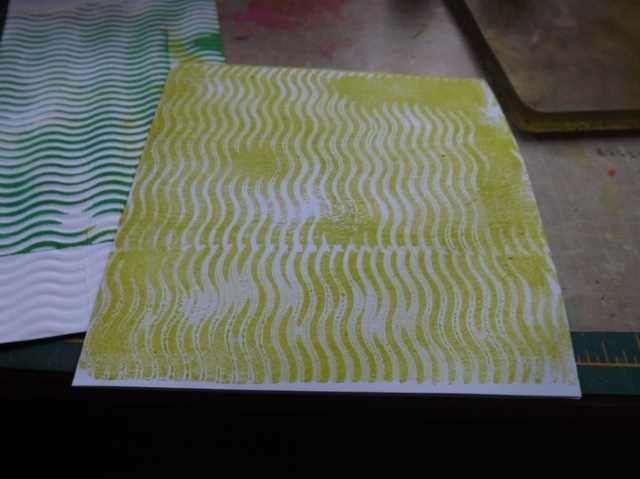 The lemon coloured wavy lines across the circles leftover under the masks from the last pull, and from the roller. A by product of using the contact paper is that the paint stays put – at least partially. 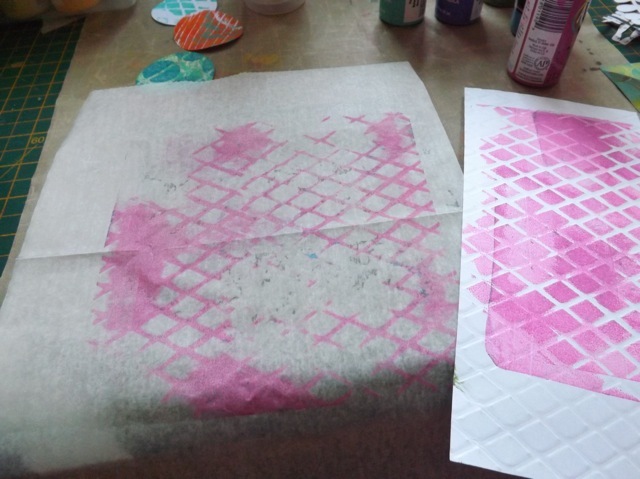 Using PAPER masks gives you lovely bits that are printed to use for other things, but contact paper gives you a second pull that is pretty nifty. Just a couple more that I did, the first just waves, this way and that, about three layers of purples with masked circles. My favourite effect with this is using metallic paint. And as you can see my embossed paper plates have been well used and they STILL work! When they don’t, it costs me nothing to just do another one. I did orange OVER the dirty plate and the gold still came thru! 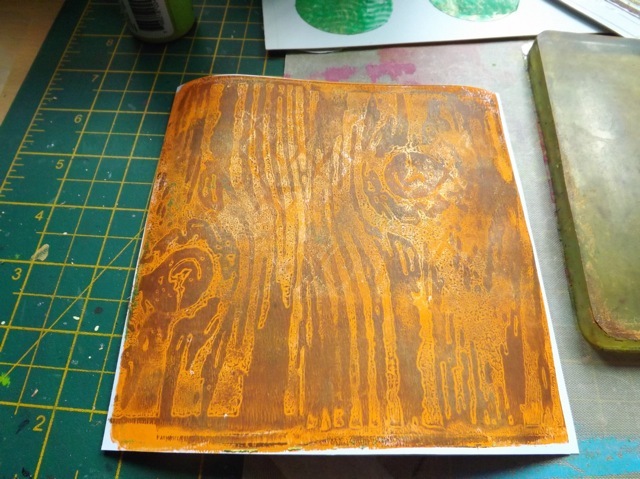 If you look back, you can see this is the same print I used the wood grain over, above. So, that is the first set – see what I mean? I could have added 10 more photos, but I won’t. I still have a couple of pretty surprising things to add tomorrow, but this should get you started – I mean, who doesn’t have paper, right? What a lovely comment 🙂 Thanks for taking the time to let me know. Great prints and very good idea with the embossing! 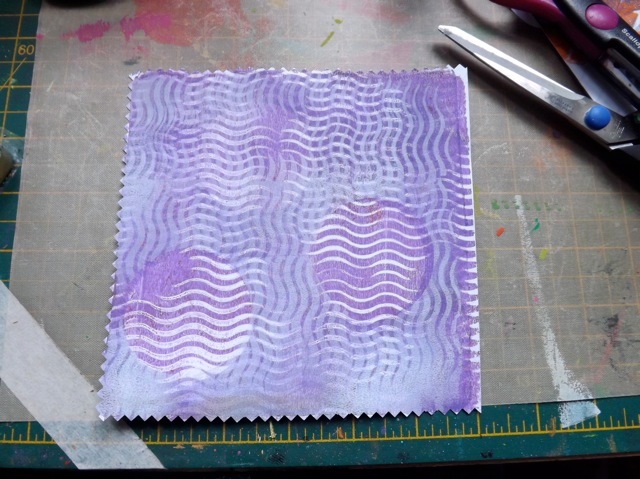 I’ve been thinking about using some of my embossing folders like a stamp but this may be an even better idea and keep the folders clean. Thanks so much for sharing this awesome idea!! beautiful prints too!!! 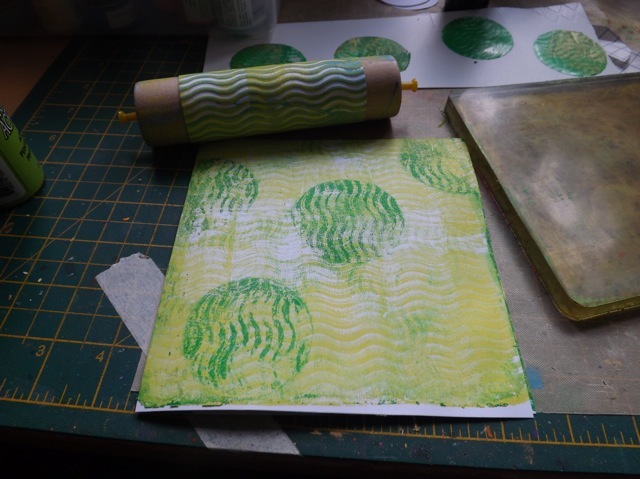 Love your variety of gelli prints! Isn’t it just too much fun!! No I know what to do with that corrugated cardboard that’s been whispering in my ear… Great stuff here – thank you! Love both your resourcefulness AND your work! Such great ideas in here! And all so affordable! Very cool to see this idea in action. 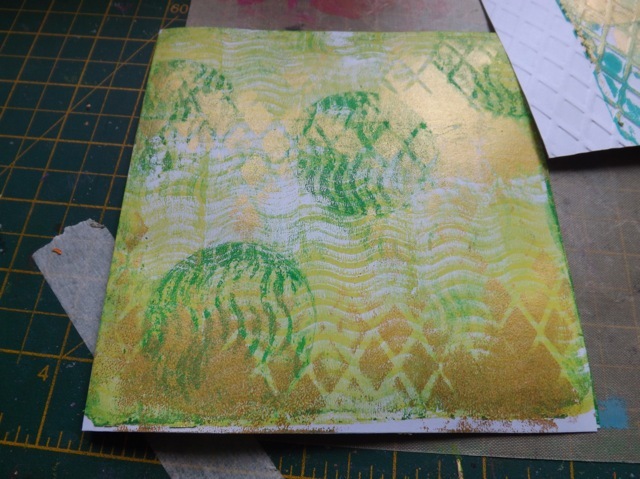 I had embossed some card stock the other day for use on my Gelli Plate but haven’t had a chance to try it out yet. It does produce some beautiful prints! 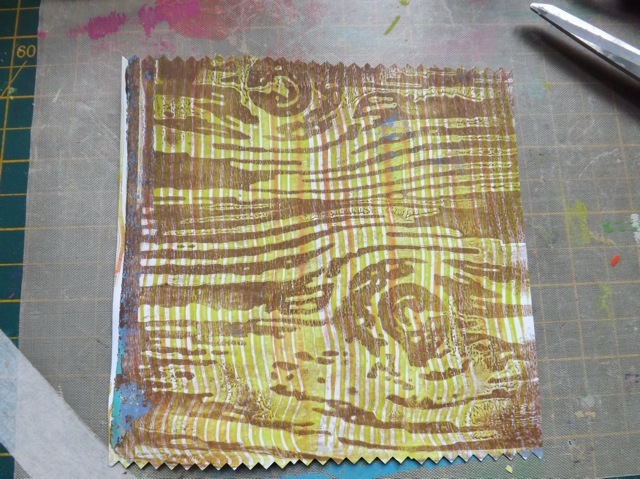 Great idea, I caved and bought a gelli and don’t want to get my folders full of paint. Thanks for giving me a reasonable way to get some neat backgrounds! 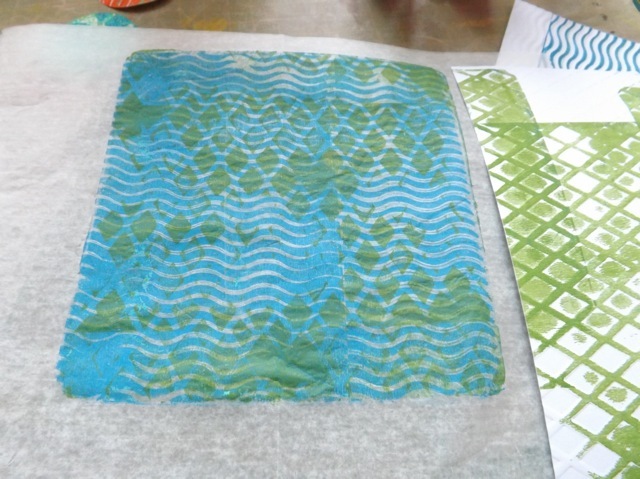 Would love to see what you are going to do with all of the lovely printed paper you are making! Wow! Thanks for sharing these great results. Can see I’m going to have to get a plate, and I was resisting so hard. Look forward to seeing what you come up with tomorrow.